Ald. 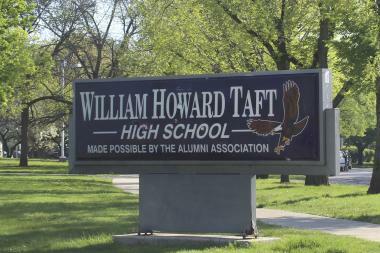 Nicholas Sposato (38th) will announce plans to build a new campus for Taft High School next week, he said. DUNNING — Ald. Nicholas Sposato (38th) will announce plans next week for a new campus for Taft High School freshman and academic center students near the Dunning-Read Conservation Area, DNAinfo has learned. The school, planned for the intersection of Irving Park Road and Oak Park Avenue, will accommodate all Taft High School's freshmen in addition to the roughly 250 seventh- and eighth-graders in its academic center, Sposato told DNAinfo in an interview. It will be large enough to serve about 1,200 pupils. The campus is set for the northeast corner of the intersection, the same spot where a sports field was proposed and then shot down by Gov. Bruce Rauner in 2015, Sposato said. A "multi-use" turf field will be attached to the school, he said. "Hearing from the district and the mayor and everyone, we thought it would be too hard to come up with a new boundary and everything for a new [high] school, so we thought a 'Taft South' would be easier and make more sense," Sposato said. But that doesn't mean elementary school boundaries will be untouched, Sposato said. The new Taft campus will accept students who graduated from Dever Elementary School, 3436 N. Osceola Ave.; Canty Elementary School, 3740 N. Panama Ave.; and Bridge Elementary, 3800 N. New England Ave. It will also accept all students from Smyser Elementary School, 4310 N. Melvina Ave., Sposato said. Currently, some Smyser graduates are directed to attend Steinmetz College Prep, 3030 N. Mobile Ave.
Once students from nearby Dunning finish ninth grade at the Taft freshman campus, they'll "have the option" to attend either Steinmetz or Taft's main campus in Norwood Park, Sposato said. This year, 3,297 Taft students attend class in a building meant for 2,184 bodies, making it the city's most overcrowded high school, according to Chicago Public Schools data. Because of the new elementary schools feeding into Taft, enrollment at the high school's main campus will likely creep back up to about 2,700 students after an initial drop, according to principal Mark Grishaber. Although plans for the school are taking shape, officials are tentatively calling the school "Taft Freshmen Academy," Grishaber said. The new school will be a "win-win-win" for the school and surrounding community, Grishaber said. The principal has long lobbied CPS officials for better classroom and athletic facilities, which he says don't stack up for a school with Taft's size and performance. "For the longest time, Taft has felt like a little brother getting all the hand-me-downs," Grishaber said. "So it feels good for the mayor and [Chicago Public Schools] to put us first and acknowledge that we need some new facilities." The school is scheduled to open for the 2019-20 school year, Grishaber said, but both he and Sposato said they hope to have it ready by 2018. Last year, Taft earned a Level 1 rating from Chicago Public Schools, the second-highest possible, for the second year in a row. Sposato made a reference to the school in December, when CPS officials announced they were setting aside $75 million for a "middle grades school" on the Northwest Side. Sposato will unveil the plans at 6:30 p.m. Jan. 31, at Merrimac Park, 6343 W. Irving Park Road, he said.